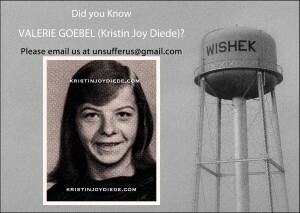 It has been twenty-two years since Valerie Goebel (Kristin Joy Diede) disappeared along with Robert Anderson from Wishek. Please help us raise awareness about this open and ongoing and unforgotten Cold Criminal Case in North Dakota by sharing this on social media and with friends. Did you know Valerie Goebel personally? Send an Email to unsufferus@gmail.com and help us gather stories and memories of Valerie.